A woman in her 50s died in a car crash in Wheeling, Illinois in January 2013 when her car collided with a semi-truck making a left turn. The driver of the truck was not injured. The incident is typical of what often happens in car-truck collisions. The driver of the smaller vehicle is killed, but the truck driver walks away from the accident. Any accident involving a large truck and a smaller vehicle or pedestrians often has tragic consequences. Trucks vastly outweigh automobiles. A big truck can weigh more than 80,000 pounds and can be up to 75 feet in length. According to the United States Department of Transportation (USDOT), more than 200 fatal truck crashes occurred in 2005. The department also reported that 8.5 million large trucks are on the nation's highways. In Illinois, there were 170 fatal truck crashes in 2005. The state with the highest number of truck fatalities was Texas, with 427 that year. The US Department of Transportation (DOT) said 12 percent of all traffic fatalities in the United States are caused by truck accidents. Tractor-trailer accidents are especially dangerous; in these accidents, the passengers or driver in the smaller vehicle are killed 98 percent of the time instead of the driver or passengers in the truck. Nevertheless, more than 75 percent of truck accidents are caused by an error made by drivers of smaller vehicles. More truck accidents occur in rural areas (68 percent) rather than in urban regions (32 percent). The Department of Transportation also reports that the majority of all fatal truck accidents -- at 78 percent occur on weekends. Driver drowsiness episodes were eight times more likely between midnight and 6 a.m. than during other times of the day or night. Drivers slept for only about five hours, which was two hours less than what they said was best for them. Drivers were not very good at assessing their own levels of alertness. For more than 40 years, Kreisman Law Offices has been handling truck accident claims in Chicago and Illinois. A truck accident is typically more expensive and complicated than an automobile crash case. 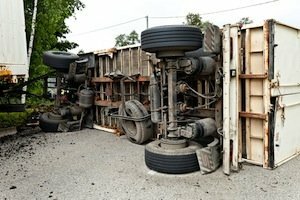 You need an attorney like Robert Kreisman on your side who understands the unique aspects of truck accident claims and who knows how to recover the most for his clients. Truck accident cases differ from a car crash claims primarily because of the unique circumstances arising from these types of crashes. For example, tractor-trailers oftentimes can "jack-knife" so that the two parts of the vehicle are at a 90-degree angle. The tendency for a truck to jack-knife may occur because of front brake issues. Many truck accidents are caused by brake malfunction. The brakes, like all equipment on a truck, must be regularly maintained and inspected. Truck roll-overs are one of the most common causes of fatalities in trucking accidents. These can occur because of driver error, truck malfunction, low inflation of the tires, brake failure and highway conditions. Driving a commercial truck is a job and the driver is a paid professional. Additional factors and regulations come into play in trucking crashes that don't exist in car accidents. In order to drive a commercial vehicle in Illinois, the driver must be tested and qualified for a commercial driver's license. Furthermore, in order to drive most trucks in Illinois, the driver must also pass a physical examination required by the Federal Motor Carrier Safety Administration. If any of these rules and regulations are not followed, violations can play a part in the investigation and prosecution of a trucking accident. If you or a loved one has been injured by a trucking accident, you may have a personal injury claim. Please call Chicago Injury Lawyer Robert Kreisman 24 hours a day at 312.346.0045 or toll free 800.583.8002 for a free and immediate consultation, or fill out our contact form online.